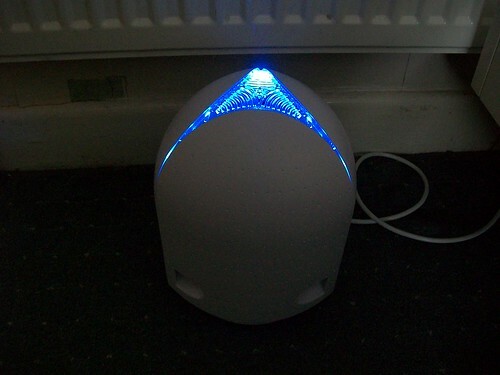 This is a different type of gadget I am going to review here - an air purifier. I made the decision to buy an air purifier after our family had a bad case of flu running around (Don't worry, it was long before the swine flu). I don't think any of our kids is allergic to pollen but we don't want to risk it. The first one was a bargain I grabbed at the local Lloyds pharmacy. It has a ioniser and a filter. However my wife was not really satisfied and we finally decided on the Airfree P80 after a bit of searching on the web. We bought it from the Breathing Space site for £199. I was initially sceptical about it's claims of being "The World's safest and most tested air purifier" and I was wondering how it purifies the air without using any filter. However, reading the reviews on various sites convinced us that it was the right choice. As soon as we received it, I took it out of the box and started it up. It has a nice futuristic design which makes it look like something out of a Dr. Who series. At first I was surprised that it was so silent. Unlike the other one which makes a right racket. I could feel clean and slightly warm air coming our of the top vents. 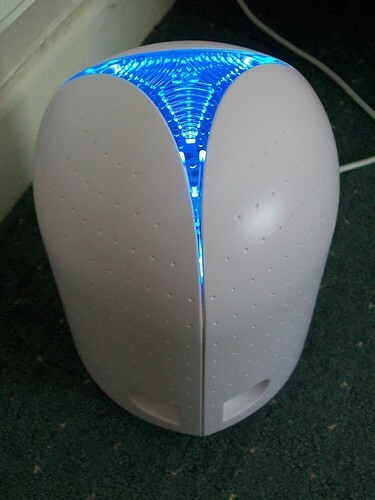 The air purifier works by passing air through a heated ceramic core incineration chamber which kills all germs and cleans air that passes trough it. It also has a pleasant blue light which is actually quite soothing at night. It may be my imagination but we sleep better at nights and the air in the house seems fresher when ever we enter the house. The Airfree P80 has definitely been one of our best investments so far. i wonder how much will that thing cost over here. it looks cool. anyway, u heard about the new seo challenge and jombincang dot com. Air is very important thing for the each and everything who has the life. Excellent site as well as excellent polluting of the environment subject too. All of us perform have to be much more thoughtful in our atmosphere. Thaks.